A gray-haired, hoodie-wearing guy in his mid-fifties repeatedly cracks open stink bombs in charity stores selling second-hand goods in the town of Spalding, England. What’s weirder, the idea of a middle-aged serial stink bomber or the fact that nobody has managed to collar this nutjob? Hard to believe these are the people whose parents won the Battle of Britain. Yes, indeed, Mr. Stink Bomber, sir, and if you’ll just be kind enough to submit a 50,000 word manifesto on your grudge against charity shops we’ll be ever so happy to read it on the telly and take all reasonable measures to meet your demands halfway. 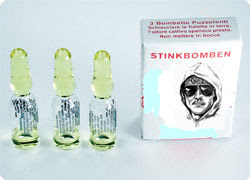 According to Spaulding Guardian reporter Lynne Harrison, the Stink Bomber often strikes between noon and two on Wednesdays. Since Constable Smith has no balls, the shopkeepers should get creative. Surely a few members of a local rugby team might be willing, in return for a couple of pints, to conduct an impromptu stakeout and tackle practice next Wednesday. They could call it a charity match.